Dhaka, 5 August, Abnews: Prime Minister Sheikh Hasina on Sunday asked the guardians and teachers to take back their children to schools as pursuing education is their only responsibility. “I’ll request all that this is enough now, stop it, let the children go back to their homes and pay attention to their studies,” she said. 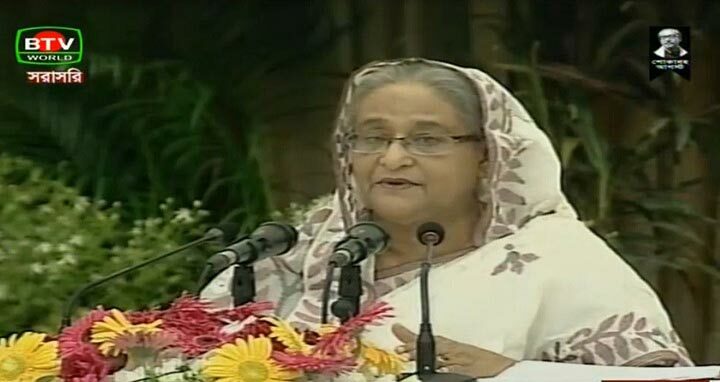 The Prime Minister said this while inaugurating optical fiber connectivity in 300 unions of 10 districts under ‘National Information and Communication Technology Infrastructure Development (Info-Sarker Third Phase) through a videoconference from her official residence Ganobhaban. The Prime Minister said the government is implementing all the demands of the students one by one. “What they’ve done is enough, we didn’t resist them, now the third party is out there in the field, if anything happens who’ll take the responsibility?” she questioned. The Prime Minister mentioned that there is nothing left that the third party can do. “Let them give attention to their academic activities, let them build themselves as worthy citizens of the country so that they could lead the country and make it more beautiful,” she said. The Prime Minister also urged the people of the country not to pay heed to rumours and get confused by false propaganda. “A vested quarter is trying to create instability in the country through false propaganda. Please don’t pay heed to any rumour and don’t get confused by any false propaganda,” she said. “Whatever you see or hear, verify those first, please don’t believe anything without verification, I’ll specially request the school students and youth folks about it,” she said. The Prime Minister exchanged views with beneficiaries in five districts -- Kurigram, Nilphamari, Bagura, Netrakona and Rajshahi. The main goals of the Info-Sarker 3rd Phase project are setting up the optical fibre connectivity in 2600 unions of the country and Dense Wavelength Division Multiplexing (DWDM) network in 400 upazilas of 64 districts. Palak said some 10 crore people will come under high-speed broadband connectivity with the implementation of the project. Principal Secretary at the Prime Minister’s Office Md NojiburRahman conducted the function, while ICT Division Secretary Zuena Aziz made a presentation on the project. The Prime Minister said the children came down on the streets and they have been doing what they want for the last few days. “They’re checking vehicles and papers. I don’t know what they actually know about the checking, but they’re doing that. Police, BGB and Rab have showed their patience, we all are helping them, our ministers, MPs, judges are obeying what they are saying. We didn’t resist them. We can realise their sentiment and pain,” she said. Coming down heavily on a section of people who always try to fish in the troubled waters, Hasina said they are trying to create a situation where they could gain some results. She said they have no right to create confusion through false propaganda. Hasina also urged the students to remain vigil so that the image of the independent country that earned through huge sacrifice must not be tarnished. About the recent accident where two students lost their lives, the Prime Minister said she was very much sorry and took immediate steps. The Prime Minister said the government has already taken a move to enact a traffic law.